Brittany's Book Rambles: Social Media & Teens! Guest Post by #famous Author, Jilly Gagnon! Jilly Gagnon is the author of the young adult novel #famous (from HarperCollins/Katherine Tegen, published February 14, 2017), and the co-author of the Choose Your Own Misery series of comic choose-your-own-path novels for adults. The first installment, The Office Adventure, debuted in January 2016. She lives in Boston with her two cats, Captain Gentleman and Zelda. She loves terrible television and well-crafted Manhattans. The number of silly, embarrassing, or downright-stupid-and/or-dangerous things I did as a teen is...well, there's no way for you to know whether the number is staggeringly high, near-nil, or whether any single moment might have completely changed the direction of my entire life. Some of those moments were recorded, tucked away now in physical photo albums, desperately emo hand-written journals, and the occasional instant-messenger-conversation-printouts (whoa there, high tech). Functionally, though, none of them exist today unless I want to share them. I had the luxury of growing up JUST before the wave of constant-connectedness and uninhibited sharing that is social media crashed on the shoreline of the new millenium. I thank my lucky stars for that every single fricking day. Social media plays a huge role in my young adult debut, #FAMOUS. In the story one casual photo, meant as an inside joke between friends, unexpectedly goes viral, causing a whirlwind of fame, cyber-bullying, and most of all constant visibility that changes both my main characters' lives overnight. It's not only the kind of story that could happen today, it did. Alex Lee is still internet famous, but you may remember him better as #AlexFromTarget, a regular 16-year-old, working as a Target cashier one day...an instant celebrity the next. But that's just one aspect of how social media plays out between teens, and if we're being honest, between adults. For every overnight success story, there's someone being cyber-bullied over an ill-chosen tweet or snapchat, screengrabbed in one of their least-flattering moments, or pilloried for a slip of the (digital) tongue. Because that's the scary part of the internet that we so often choose to forget: all of it is forever. The goofy thoughts I tweet; the pictures of my cats on instagram; the blog posts from almost 15 years ago, when I was a barely-formed Jilly-shaped lump of brain plasticity: they're all out there. Some have been deleted of course, or simply buried by the constant avalanche of new information available online. But anyone could find any one of them if they so desired. The idea of banning teens from social media seems cruel, and more importantly, impossible. The modern, connected era is here to stay. We can, however, remind teens and adults alike that what you say behind the protection of an avatar, to a tiny picture up in the corner of your screen, matters. Every single one of those little pictures corresponds to a real person, with real feelings, and real fears...unless it corresponds to a bot trying to sell you enhancement pills, but let's not split hairs. Things that we do IRL almost as a matter of course—bite back our cruelest thoughts, assume there's some context to most conversations or actions, listen to the other side of the story—we should be doing online, too. Because all those things still apply, they're just not as immediate-gratification-inducing as a like button, or a vitriolic @ comment. The cyber-bullies in my story only appear onscreen briefly, felt mostly via the impact they have on Rachel, the target of their snark and cruelty. But each one of them has a story, too, a whole life happening offstage before and after the horrible comments they leave on a stranger's feed. We all have that, in fact. But social media reduces us to a few words, a tiny thumbnail photo, and a constantly-refreshing stream of chatter that makes it hard to fully imagine our throwaway thoughts having a lasting impact. So we have to remind ourselves—and our teens—that our words matter, no matter where we're saying them. We can't—and shouldn't—turn back the clock on the internet age. But we should take the time to think about what we're doing with our newfound power, whether it's hurting a real-live-someone out there...and whether maybe a kittens-and-sloths video wouldn't be the better option, at least every once in a while. Thanks so much, Jilly, for stopping by the blog and for writing such a thoughtful and interesting guest post! 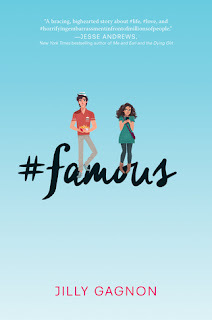 And guys, #FAMOUS is in stores now, so be sure to check it out and let me know—did you read it? What did you think? Immediately thought of Alex From Target as I read the description. The netizen's life is a very interesting topic to cultivate! Well, I believe it's partially based on what happened to him! I hope you check out #famous! I'm glad you enjoyed this post, thanks for stopping by! This does sound like a good one! Your review makes me want to read it more. Like you, I am so glad I grew up before the social media explosion, only I was lucky enough there weren't really cell phones or Internet to deal with either. Great review! I read this book back in January and absolutely loved it. There were some parts of it I didn't like at all, but some parts, such as how Rachel was bullied, seemed so spot on and realistic. I have to admit, I'm really glad cell phones and tablets weren't really a part of my teen days...we only had dial up internet so I didn't really have the chance to do anything too goofy, haha. I'm so glad that you liked it! And I'm totally with you there. There were cell phones when I was growing up but I remember when it first came popular. Thanks for stopping by! I'm so glad that this guest post has made you want to read #famous. If only people would realize that there are real people behind the screen. I hope you enjoy #famous, thanks for stopping by! Already had this one on my TBR. Loved Gagnon's thoughts on social media. I also grew up without all this (seriously, the internet arrived my senior year of college). I appreciate all the great things about social media, but abhor when it is used for nefarious purposed. I grew up with it but not at the point social media is now. I hope you have #famous on your TBR!